Bounce Back Safety Surfacing tiles are a shock absorbing resilient rubber mat that provide long-term answers to safety, while offering ADA accessibility. Harmful objects can hide in loose fill product like sand, wood chips or gravel. Bounce Back's solid construction does not allow foreign objects to hide. There is also no loose fill material for children to kick, throw or swallow. Design allows for continuous use even during the rainy season. Because water does not puddle on the surface, but moves quickly through the top and through the "legs" of the cushions, the play area is ready for use soon after heavy rains. No daily maintenance required to maintain safety standards means less cost, less hassle. It looks and performs great! Proper safety and protection 24 hours a day, 7 days a week, 365 days a year. 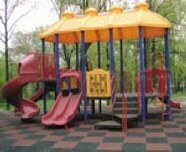 Unlike loose fill, product in the most critical Fall Zones is not displaced by children during play activities. Unlike loose fill, Bounce Back has a consistent shock absorbency throughout the play area and has the ability to meet all safety standards for Fall Zones higher than a 6' fall. Less worries. Fewer Injuries. Reduced Liability. Lower Premiums. Many Colors Available: Solid colors include Black, Red, Green, or Blue. Black with a variety of color fleck options are also available. Earth Friendly. Each 24" x 24" safety tile is made from scrap tires that would otherwise be landfilled. Bounce Back can be recycled again and again. Low cost installation that is easily installed over concrete, asphalt, or roofs by grounds personnel or support groups. Bounce Back cushions meet and exceed the requirements as established by the Consumer Product Safety Commission (CPSC) and Americans with Disability Act (ADA) and American Standard for Testing Materials (ASTM) methods. Testing is done regularly. 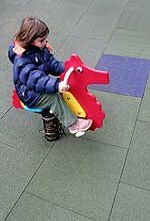 It is committed to the environment and to the end-user’s environment, in this case, the reduction of children’s injuries on the nation’s playgrounds.